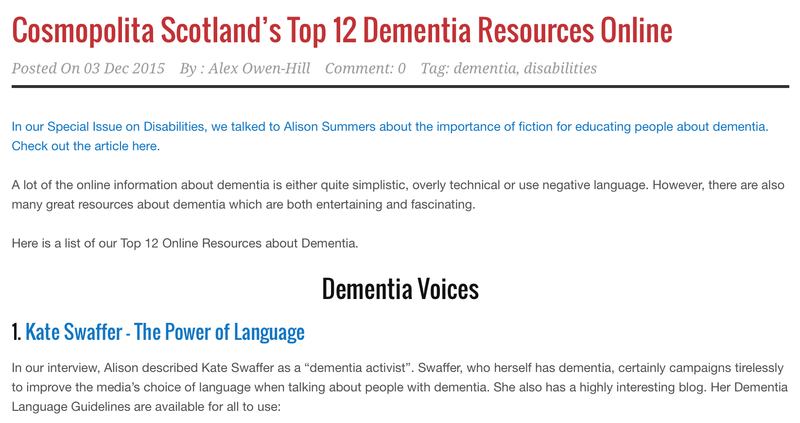 Apart from the thrill of finding out one of my blogs titled The Power of Language was the top resource for Cosmopolita Scotland late last year, I remain confused that people find it so challenging to respect the wish of many, not to PUBLICLY refer to people with dementia as sufferers. Yes, I am happy about this… and also confused (well, it is Sunday!). It is good to be published in places other than my own blog, of course, but the joy of the internet these days is distribution can be more global very quickly than if simply published in a journal. Online writing, whether via a blog or a journal, makes it easy for others to find you, and also you find out quickly if others like or hate your work. I hope this article, which has also recently been published in an American Physicians journal, and has been translated for a newspaper in Mexico and other places as well, makes a little bit of different. Yes, of course we all suffer some of the time, perhaps even more often than we would like, and certainly more often than people who are not facing a terminal, progressive, chronic illness. But labelling us as if we are all suffering, all the time, is not only inaccurate, it is, for a vast number of us, offensive. So why then, are so many people with and without dementia publicly refusing to respect our rights, and the wishes of so many, to be respected in the public domain? The Dementia Language Guidelines referred to by Cosmopolita are from Alzheimer’s Australia, and were updated by a large group of consumers including many people with dementia in 2014, and until they produce their own, these are also the guidelines recommended by Dementia Alliance International. Kate, when I first subscribed to your blog, I remember you commenting that you could not include a link to my blog because you said I had referred to people with dementia as sufferers/suffering which I had, albeit rarely. At the time, I found your stance with respect to my blog harsh and overly judgmental. Looking back, I still find it harsh and overly judgmental. Until I was introduced to your blog, I hadn’t thought about the idea of suffering in the light that you present it, and yet you immediately punished/sanctioned me for my inadvertent ignorance. I read your arguments, they made sense to me; I went back and reviewed my entire blog and changed all references to suffering/sufferers. However, I still feel that your judgment of me and the blog was unjustified, given that I had zero intention to offend and every intention to help, and, as I said, I was coming from position of ignorance. Further, based on my own experience, I think it’s really difficult for people who are care partners to fully understand your perspective as one of the most painful things, again based on my own experience, is to be helpless in the face of a loved one’s suffering. And, as you rightly point out, we all suffer, whether we have dementia or not. However, the challenges of this disease inflict a special kind of suffering that is particularly heart-wrenching to watch. You have spoken about it in other blog posts. For example, your losses with respect to music appreciation. When we see someone we love lose something they love, the suffering of watching them suffer I think is even more painful than what they are going through. I have felt this on many occasions with my mom. I have even caught myself saying / thinking “I am suffering more than she is.” Maybe those of us who are care partners project our own suffering onto the people we’re carrying with. This is not an excuse; it’s a potential explanation. I’m thankful that I found your blog, and threw it have been able to gain a new perspective. All of that said, I think many people who live with dementia sufferer a great deal. Perhaps many of them don’t have the advantages you do. Just before Christmas, my uncle was removed from his home and has since been “relocated” to three different facilities from which he has tried to “escape;” he has been increasingly sedated with antipsychotic drugs against his will because the health care system in Canada is woefully inadequate and nobody knows how to properly deal with people who live with dementia when they are in crisis. I guarantee you my uncle is suffering. He’s been ripped from his home; put into strange places with strange people; given drugs that have caused him to behave in ways he never would have; etceteras. As I stand on the sidelines and watch this scenario unfold I can’t tell you how frustrated I am, having already gone through it with my mother. I continue to watch her being abused on a daily basis, and I’m powerless to do anything to change it. I’m not sure that you can imagine the suffering I go through every single day when I go to see her. Does that make me a “sufferer?” yes and no. I suffer; yes. But that is part of life, as you rightly point out. We all suffer whether we have dementia or not. My mother suffers less from dementia than from the inadequacies of the systems we have to care for people who live with the disease. I would ask you to be compassionate, understanding, and patient with those who have different perspectives than yours. Some misunderstandings and incorrect labels may come from the nature of healthcare systems rather than from the disease itself. I also thank you for giving me a new lens from which to understand this disease and the people who have it. The more people can collaborate and work together, the better off we will all be in the less all of us will suffer. My suggestion is to do whatever we can to build bridges rather than create barriers. Thanks for your thoughtful comment, and yes, building bridges is always the best way forward. On this particular topic, it is difficult to build bridges, when so many still insist on labelling us all ‘sufferers’. My husband often says too, he is ‘suffering’ watching what is happening, most often, far more than I am, which sometimes is also because I am now less aware and have less insight. When I was grieving for a partner after his suicide, I was suffering far more than I ever have with dementia, but none labelled me a sufferer then – so I continue to why must people with dementia be seen in this way. Much more of the suffering comes from the way we are treated, even in the case of you uncle, it was possibly what happened to him, rather than the actual dementia? I also think suffering and loss, is actually good for us, in small doses… but almost no-one does so all the time. I totally agree with you that the way we “care” for people with dementia causes more suffering than the dementia itself. The whole damn system needs to change, and you’re absolutely right or perception also needs to change. I’m glad to be part of a worldwide community which includes you and many others who are working hard and advocating for the kind of change that needs to happen. Thanks Kate for everything that you’re doing. You are a hero. So true about suffering. Some people some of the time, yes. But not all people all of the time. And yes, how you talk about Dementia/ Alzheimer’s colors how you feel about it, how you think about it, how you deal with it and how you interact with those who have been diagnosed with it! As you know, Kate, I have always said Gregory was not a victim, he was a hero. Gregory suffered, I as his care giving partner suffered as well. Family and friends suffered. But we laughed, played, visited, enjoyed, and frolicked more than we suffered! But for the most part Gregory and my life was full, fun, exciting, joyful, loving, calm, compassionate, and contented. Gregory and I chose to not let the Dementia/ Alzheimer’s define us. It defined what we were up against some of the time but not all of the time and we didn’t let it rule who we were and how we lived. Perhaps this pervasiveness of “suffering” as part of life, is why people see people with Dementia/ Alzheimer’s as suffering, without qualifying some of them, some of the time. Perhaps people do not realize that suffering can be a teacher, can be overcome, can be reduced to a small part of what life really is about! Perhaps it has to do with the observers own journey through and perception of life and perhaps it is because it is frightening to the observer to have to deal with the impermanence of their own lives. Follow up reply to check the “Notify Me” box which I often forget to do. Love ya Kate. And I think it has to do with the definition of suffering and a deeper understanding of what it means. Thanks for your thoughtful comments, and I will have to go back and read some Buddhism teachings again it seems… certainly the pervasiveness of suffering is causing more harm to many of us with dementia than is helpful.